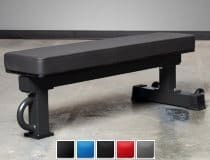 Home > Blog > Equipment > Rep FB-5000 Review: Is This the Best Flat Bench You Can Buy? 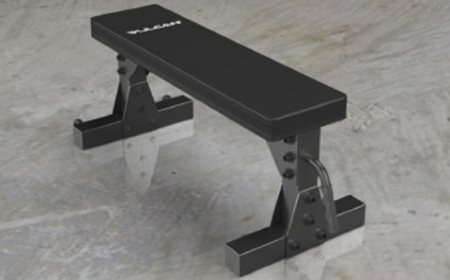 By the end of this Rep FB-5000 review, you’ll know whether or not this is the best flat weight bench for your home gym. 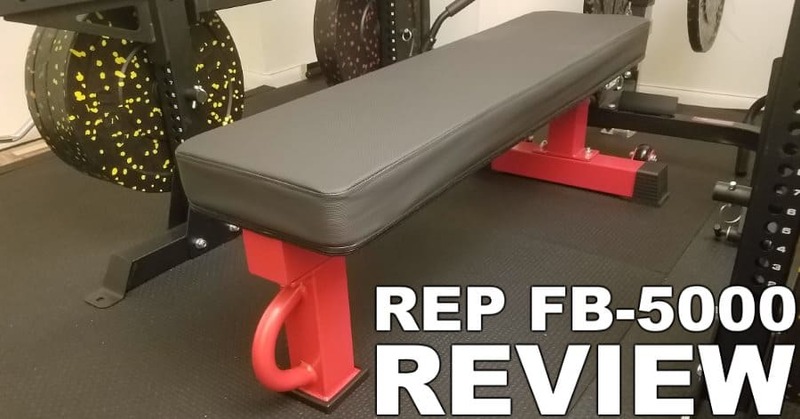 At the time of writing this review in April 2019, I’ve been able to thoroughly test the Rep FB-5000 flat bench for six weeks of heavy bench workouts (1-2x/week). I’ll share my first-hand insights with you on the FB-5000’s performance, feel, durability and overall quality. My review of the Rep FB-5000 will also cover all its specs and features. I’ll discuss what they mean in a practical sense. Lastly, I’ll go over couple different alternatives to the Rep FB-5000 that you might want to consider. Conclusion: Is the Rep FB-5000 the Best Flat Bench for You? The Rep FB-5000 is 48 inches long. This is all the length anyone needs to do bench press, or any other exercise involving a flat bench. 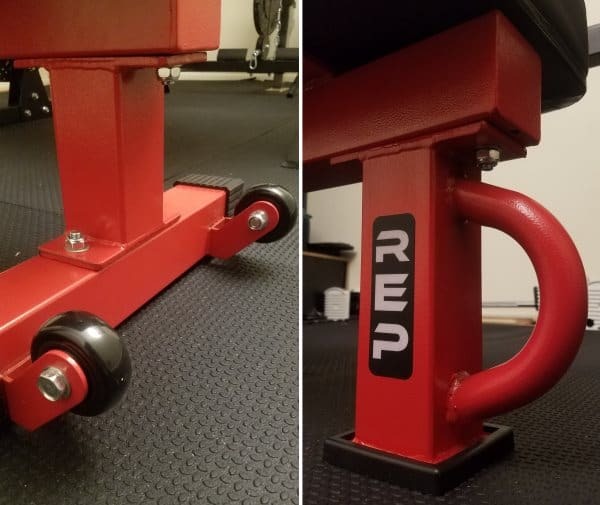 If you have the Rep Wide Pad installed on the bench frame (more on this below), the pad length will be slightly longer at 48.5” instead of 48”. It’s not like this half-inch will make a difference, but it’s worth noting. The Rep FB-5000 has a 12 inch wide back pad. This is the width of most good flat utility benches on the market. It’s IPF compliant and most people will find it to be sufficiently wide to bench with good shoulder support. However, I know that there’s a big trend in lifters wanting extra wide pads (e.g. Thompson Fat Pad) for even greater support and to ensure absolutely none of their shoulder is hanging over the edge of the bench. Usually, this is most beneficial for guys with broader frames (i.e. lots of upper body muscle mass and/or naturally wide shoulder girdle), as well as those with nagging shoulder issues. If that’s you, then you’re in luck! You can buy the FB-5000 with Wide Pad version of the bench, which comes with a 14” wide pad instead of the 12” pad. It’s only $20 more when you do it this way. You’re not sure if you’d even like the wider pad, in which case you can buy the 12” bench first, try it, then decide if you want to buy the wide pad later. The bench height is 17 inches tall from the floor to top of the pad. This is in the ideal range for optimal leg drive. Plus, it meets the IPF spec. The height of the bench frame without the pad is 13” tall. This is shorter than most bench frames. That’s because most bench frames aren’t designed to be used with a fat pad. The FB-5000 is designed exactly for that purpose. As such, the frame must necessarily be shorter to compensate for a thicker pad and still meet the IPF height spec. …First off, yes, installing fat pads from other brands is possible. Second, the 13” height allows you to install the two most popular fat pads — the Thompson Fat Pad or the Rogue Competition Fat Pad (both 4.5”) — such that the total bench height is 17.5”. That’s a half-inch higher than with either of the Rep fat pads, but it’s still IPF compliant. Rep designed the frame this height specifically to allow for this. Very smart! Note that footprint dimensions refer to the length and width that the frame takes up where it touches the floor. So, it’s usually a bit different than the back pad length and width dimensions. The Rep FB-5000’s footprint is 21” x 43.75”. This doesn’t include the wheels, which are raised just above the floor. If you were to include the wheels in the footprint length dimension, it would be 47.5″. The frame uses extra large 3” x 3” 11 gauge steel tubing. This is more robust than many other strong flat benches that use 11 gauge steel with 2” x 3” tubing instead of 3″ x 3″. The Rep FB-5000 is a competition style flat utility bench. As such, it’s going to be overbuilt so it can handle any level of strength. In addition to the tubing, there are three super thick 8 mm (5/16″) steel connector plates on the top of the frame that connect to the back pad. The steel plates are about 8 mm (5/16″) thick, which is equivalent to 0 gauge steel (lower gauge number = thicker steel). They are spaced evenly from the front to the end of the frame, and provide more than enough lateral support to the back pad to keep the entire pad stable and supported under very heavy loads. Overall, there’s absolutely no shortcuts with the frame construction on this bench. …That is, it’s not just 1000 lbs (which would still be plenty strong). Rather, it’s greater than 1000 lbs. By how much? I don’t know. I’m not sure they tested exactly how high it goes. But I’d guess it’d be several hundred pounds beyond 1000. Basically, even if you’re a heavy, elite-level bench presser, this bench can handle you. The FB-5000 weighs 62 lbs assembled. This is on the heavier side for a flat utility bench. But it’s not hard to move around your gym since it has a pair of well-functioning wheels, making it easy to roll to a different location. Whether you get the default 12” wide back pad or the 14” inch version, the total pad thickness is 4 inches. This includes the plywood baseboard, padding and upholstery cover. The 14” pad has double the thickness of plywood as the 12” pad (1.5” vs 0.75”) since a wider surface requires greater support. Both are still 4 inches in overall thickness. Both of the Rep fat pads are similar in thickness to other popular fat pads like the Donnie Thompson Fat Pad or the Rogue Competition Fat Pad, which are also compatible with the Rep FB-5000 frame. If you already have one of these other fat pads, know that you can install them on this bench if you want. The foam is very thick, as you would expect a fat pad to be. To be exact, the foam is 3.25 inches thick for the 12 inch pad, and 2.5 inches thick for the 14 inch pad. The 0.75 inch difference in pad thickness is because the 14 inch pad has 1.5 inch plywood vs 0.75 inches. It prevents “bottoming out,” or being able to feel the baseboard beneath the padding. While the foam used is quite firm, it will compress some under very heavy loads. Having extra thickness makes even coming close to bottoming out an impossibility. A super thick pad wouldn’t be necesseary for this if an even firmer material like neoprene was used; but then you’d lose out on other benefits like comfort, better scapular position/movement (see point below), and a greater resistance to deformation over time. Allows you to achieve a more stable scapular position because the padding to the sides of your shoulder blades isn’t compressed like the foam beneath them. This forms a slight reinforcement wall around your shoulder blades, making it a bit easier to maintain a tight scapular position. Allows for the minor scapular articulations (upward and downward rotation) that occur during proper bench press technique. All the while, the foam beneath you is still very firm, and provides the overall support and stability you need. The Rep FB-5000 has a grippy vinyl material that uses a three dimensional texturized pattern to prevent sliding. This is a big feature. And it’s a feature that you’ll notice every single time you use the bench. If you’ve ever benched on a bench with smooth vinyl, you know it’s easy to have your back slip and cause you to lose scapular position — particularly when you’re sweating. The grippy vinyl puts a stop to this. Unless you’re literally pouring sweat, you won’t need to chalk the bench, put a towel down or even use a Bar Grip shirt. This is now a relatively common feature on higher-end flat benches. A few years ago, it was quite uncommon. 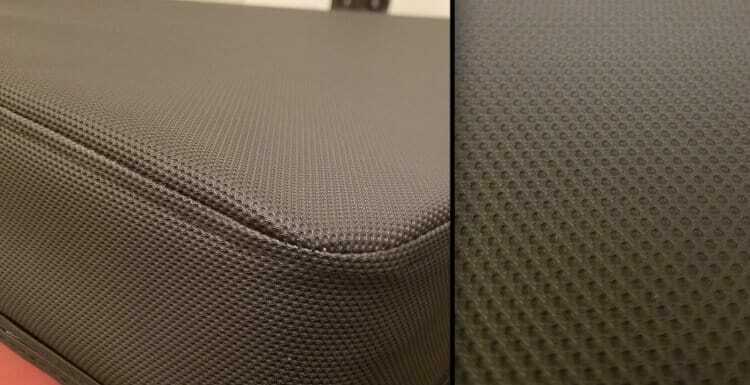 Even a couple years ago when this bench first came out, the upholstery cover was a smooth vinyl fabric. Rep quickly upgraded it shortly after launching, and it has been a standard feature ever since. The stitching is well done on this. 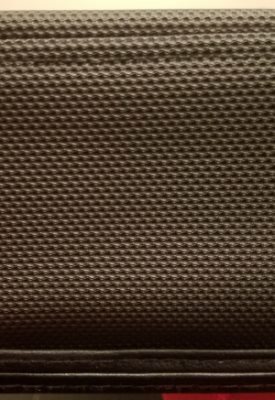 It has double stitching around the perimeter of the top and bottom edges. Additionally, there were no loose threads coming out of the stitching when I first got the bench and inspected it. And there haven’t been any that have popped up since I’ve been using it. This bench will not be coming apart at the seams, which is something you can’t say for many cheap quality benches out there. One long 3” x 3” steel tube that goes lengthwise down the middle of the bench. Three super thick 8 mm (5/16″) lateral support plates welded on top of the 3” x 3” tube. They are spaced evenly so that they’re beneath middle and both ends of the back pad when installed. The back pad is secured to the front and rear lateral support plates with four large bolts that fasten into the pad’s plywood base. The back pad frame and the hardware connecting it to the pad, are robust and highly secure. Everything in this essential part of the bench is overbuilt and stronger than it “needs” to be. This is exactly what you want in a heavy duty competition style flat utility bench. Of note: The four bolt holes on the frame will also line up with the holes on the Thompson Fat Pad or Rogue Competition Fat Pad. That’s good news if you had one of those pads and wanted to install it on the FB-5000 frame. You can do so easily. No additional drilling required. The Rep FB-5000 has a pair of wheels and a lift handle that make it easy to move the bench around your gym for different exercises. The wheels have a robust look and feel to them. Most importantly, they function very smoothly. The lift handle is well-placed on the front post of the bench. The D-shape makes lets you hold onto it whether grabbing it from the top or bottom. This is a tripod style bench. It has a single foot, or point of contact, in the front of the bench; and two feet, or points of contact, in the back of the bench. This is ideal in my opinion because it allows you to put your feet in whatever positition you want: wide, narrow, further forward, further back — Your feet will never bump into the bench’s foot, since it’s totally out of the way. This is different than many other flat utility benches that have two feet in front and two feet in back. Depending on your stance, the bench feet can get in the way on such designs; forcing you to move up or down on the bench, or use a wider stance. Tripod benches also have the added benefit of eliminating any wobbling that would otherwise occur if your floors are slightly uneven. After all that’s the whole purpose of camera tripods — the same applies to tripod style weight benches. A quick note — The first version of the FB-5000 had a slightly different front foot. Specifically, the base plate was wider than the current one by about 2-3 inches. So it was more rectangular. Also, there was no rubber pad on it. Version two of the bench has a more compact, square base plate that’s about 4.5″ in length and width. It also has rubber pad around it. These tweaks to the front foot design helped to further increase stability and give you even more space for positioning your feet. The FB-5000 has substantial rubber pads on each of its three points of contact with the floor. The pads on the rear two feet actually wrap around all sides of the 3” x 3” post. They’re very secure and won’t fall off. These rear pads also extend a few inches inward, toward the middle of the rear post, on the underside. This gives the frame a larger base of support while still keeping the rear feet distinct from each other; preserving the benefits of a tripod bench design. The front foot pad is also very secure. It wraps over the edges of the base plate that forms the front foot. I couldn’t even pull this off with my hands if I tried. It, too, will stay in place. All of the pads are load-bearing. That means they absorb and distribute the weight on the bench more evenly through the entire surface area of the rubber pads. This makes for a more stable and secure bench. Another stability-promoting aspect of the rubber pads is that they’ll form, or mold to, slightly uneven surfaces. This makes the bench more balanced than if it were just the steel touching the floor. Other benefits of the rubber pads are that they protect the feet from damage to the paint (and eventual rust). Lastly, they prevent the bench from accidentally shifting while you’re training on it. The FB-5000’s foot pads in particular all have some type of textured pattern on the bottom that provide additional traction to prevent slippage. It’s worth noting that the first iteration of the FB-5000 did not have any rubber pads on any of the feet. Luckily, they quickly added them in the second iteration. Any new FB-5000 bench will have these. You can store this bench on its end, and it will stay in place without having to lean it against a wall. It won’t be perfectly upright as you can see in the photo above. But it’s nonetheless very stable in this position. You’d have to hit into it pretty hard to knock it over. This bench has a high quality powder coated finish that will protect against scratching and chipping. It arrived virtually blemish-free and has thus far remained that way, despite me knocking into it a couple times with weights or my shoes. 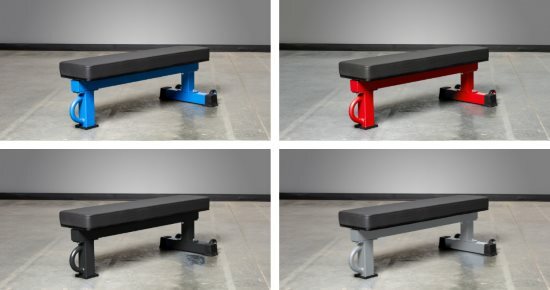 In terms of colors, the bench is available in black, hammertone red, hammertone blue, metallic black and metallic silver. 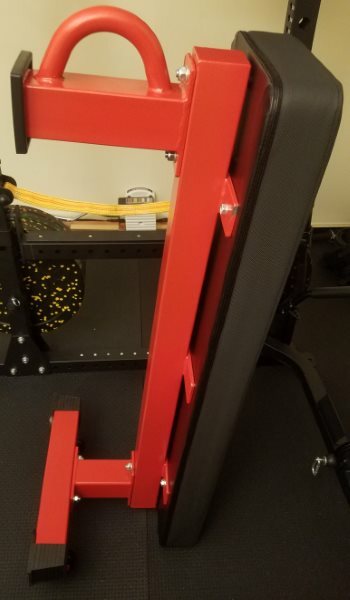 The red, blue and silver will run you an extra $10 bucks, but it’s well worth it if you want a nice splash of color to liven up your home gym area. The Rep FB-5000 is extremely price competitive for everything you get. It costs just $149 plus shipping. Add an extra $10 if you want it in red, blue or silver. If you want the FB-5000 with the 14” Wide Pad included, the base price is $169. Another $10 if you want the premium colors. 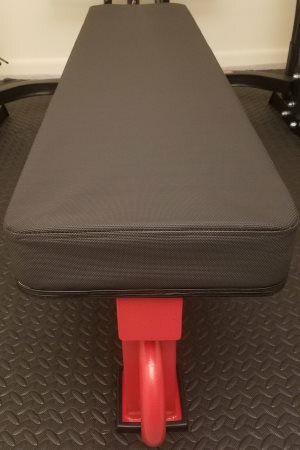 I can confidently say this is the best flat utility bench I’ve ever used. That includes the few benches I’ve owned in the past, as well as any flat benches I’ve ever trained on in commercial gyms. Of course, I’ve mostly been to big box gyms and more generic fitness centers. If I’d been to a more niche powerlifting gym or athletic facility, maybe I’d have tried some comparable benches. I sweat a lot when I train. This has always caused major issues with slipping while benching in the past. Usually, I would have to wear one of my A7 shirts, or continuously coat the bench and my upper back with chalk. Now, I can just lay down on the bench in a tank top, even if I’m sweating. If I’m absolutely pouring sweat, I’ll have to wipe down my back right before the set and maybe put a little bit of chalk on for good measure. The vast majority of the time, though, I won’t have to do anything extra. I’ll just perform the movement and the grippy material will allow me to maintain a strong arch with a stable scapular position. There’s absolutely no wobbling of the frame or the back pad on this bench. That’s something I can’t say for all the past benches I’ve owned. The stability is a direct result of good construction and quality control in the manufacturing process. The other factor is the tripod style frame design. It has three points of contact on the floor, like a camera tripod. And just like a camera tripod, it will never wobble even if it’s on an uneven floor because all three points of contact will necessary be touching the floor. There’s another big reason why I like the tripod design, which I’ll discuss in the section below. I’m really happy Rep chose a tripod style frame design. I just spoke about why I like how the tripod frame keeps the bench from wobbling. I have a pretty narrow stance on bench press. Having a single bench foot that’s front and center in the frame, gives me an obstruction-free area to plant my feet. Even the narrowest of stances won’t come close to hitting the front bench foot. If there was wider post with two points of contact in the front of the bench, my feet would no doubt bump into them. I’d have to either use a wider stance, or scooch further forward or back on the bench — both of which are undesirable options. Until this bench, I don’t think I ever had the opportunity to bench on a pad this wide. And it’s not even like this is a super wide pad. It’s just that so many benches out there are very narrow, especially older ones. 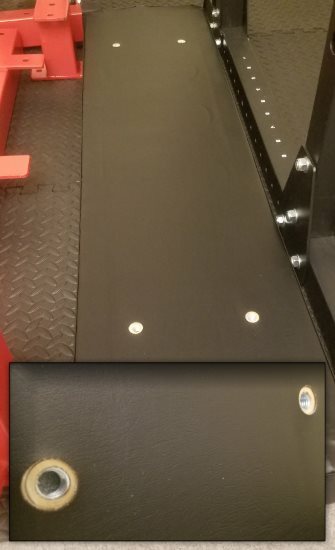 The bench pads at my current commercial gym are around 10” wide. The pads at my last couple of commercial gyms were similarly sized, maybe slightly wider. My old home gym bench, the GFID31, was actually 9.5”! Super narrow. I’ve been deprived until now. The difference is night and day. With the FB-5000, I was probably around 5 lbs stronger on bench press the first time I used it, just because of the better shoulder stability it provides. In the weeks I’ve been using it, I’ve progressed faster than I have in the previous few months. I haven’t bought this yet, but I plan to do so. Even though I’m very satisfied with 12” pad, I want to see what all the hype is about when it comes to extra wide fat pads. A couple years ago, you only had the option of the Thompson Fat Pad, which was (and still is) $150+. Titan then came out with their Hefty Pad, which is still almost $80 and has mixed reviews regarding its quality. However, Rep came out just last year (mid-2018) with their 14” wide fat pad for just $50. The customer feedback has been very positive across the board. I am more than willing to pay this price to be able to experience the benefits of an extra wide back pad. Plus, I’ll have two different pads that I can swap as needed. I’ll be sure to update this Rep FB-5000 review after I buy the Rep wide pad. REMINDER: I already mentioned it earlier, but I’ll repeat myself here if you missed it — If you already know you want a wide pad and don’t need or want the 12” pad, you can buy the FB-5000 with the 14” pad included. This is only $20 more than the default FB-5000 bench. So, you’ll save $30 vs if you bought the default FB-5000 + the 14” wide pad. The four sub-sections above are my personal favorite features of the FB-5000. Of course, there’s plenty more to like about this bench. And I detailed all of that in the earlier sections where I went over each feature and specification. If you haven’t noticed, this Rep FB-5000 review has been pretty glowing so far. In my reviews, I always strive to be as honest as possible and point out any flaws where I see them. However, it’s very hard to find any faults with this particular bench. It checks every box. And it does so at a very good price. If I really have to reach, I guess I could nitpick that the grippy vinyl is harder to clean than a bench with smooth vinyl. The little indents in the textured pattern collect chalk, dust or dirt over time. So you can’t really do a gentle wipe-down like you can with a smooth vinyl cover. It’s more effective to aggressively dust or sweep it off to get the debris out. Also, sometimes I’ll see a white outline of my lats after benching in a tank top or stringer. I think the strong traction of my lats driving into the grippy vinyl is actually exfoliating my skin! I’ll happily trade a little extra time cleaning the bench cover for a super grippy pad. No fat pad available standard or sold separately. This means no 12 inch fat pad and no extra wide (i.e. 14+ inch) fat pad. The default pad is a thinner, but sufficient 2.5” pad. The holes on the frame don’t align with the bolt holes on third-party fat pads (i.e. Thompson Fat Pad, Rep Wide Pad, etc.). 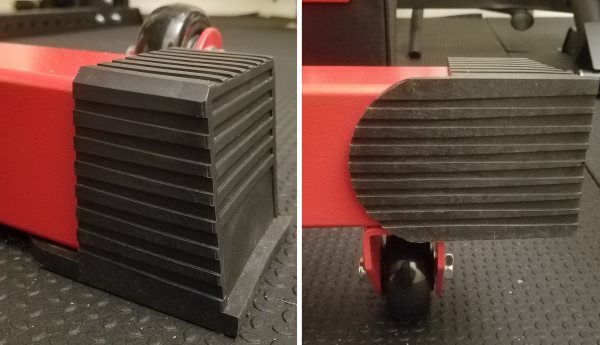 If you have one of these fat pads and wanted to use them on the Vulcan frame, you could technically drill new holes into them to match the frame’s holes (ideally by installing bolt anchors in the wood first; otherwise by using lag bolts straight into the wood). Even if you did all this, you’d still have another problem — The frame height without any pad is 14.5”. 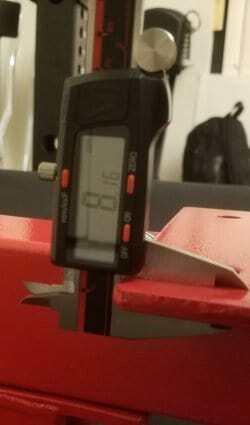 With a fat pad, the bench height will be well over the IPF’s max height spec of 17.5”. For example, it would be 18.5” if you installed the 4” thick Rep Wide Pad, or 19” if you installed the 4.5” thick Thompson Fat Pad. Does not have a tripod frame design. The front feet consist of an approx. two-foot wide post made of 3”x3” tubing. It’s just like the one in the back of the bench. Since it takes up so much space width-wise on the floor, it can interfere with your foot placement. No rubber pads on the feet. The bottom of the feet is just the same powder coated steel as the rest of the frame. There is no rubber to protect the powder coating or to prevent the bench from moving during use. So, over time, the powder coating could scratch on the feet, especially if you use the bench on cement. Also, it’s more likely to accidentally shift out of place on certain exercises. 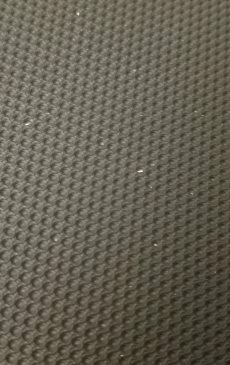 However, these issues are minimized if you use it on good gym flooring (e.g. stall mats or something similar). The bench length is 43.5 inches long for the Vulcan bench vs 48 inches for the Rep bench. 48 inches is also the IPF spec for minimum bench length. That said, bench length is the least important spec, since a 4.5” pad length difference shouldn’t affect performance. As long as you’re not in the NBA basketball player height range, you’ll still have more than enough room to position your torso as needed on the bench. I don’t see this shorter length spec as a major negative point for most lifters, but I want to point it out for anyone insisting on getting an IPF spec flat utility bench. Fat pads available. 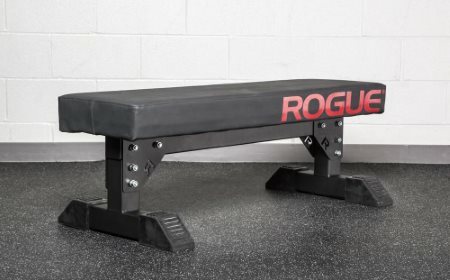 Just like the Rep FB-5000, the Rogue Monster Utility Bench has multiple fat pads available. However, unlike the Rep, both of the fat pads are optional upgrades. The Rep bench comes standard with the 12” fat pad, whereas the Rogue bench comes standard with the a 12” standard thickness pad (2.5” thick). You can upgrade to either the Rogue Competition Fat Pad (comparable to the default Rep fat pad) for $30, or the Thompson Fat Pad (comparable to the Rep Wide Pad) also for $30. NOTE: Rogue originally just had one frame height (without the pad) of 15.25”. 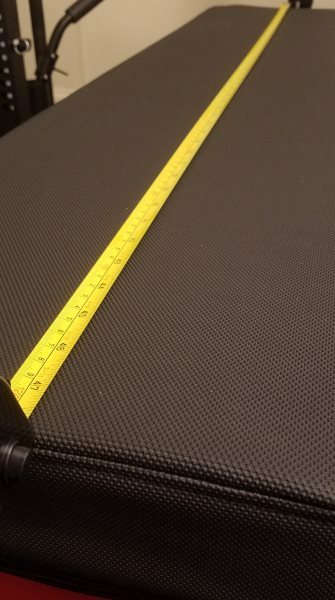 This was perfect if you got the standard pad (2.5” thick), since the total height would be 17.5”. However, many people didn’t like this because the total bench height would be 19.75” if using either of the fat pads (both 4.5” thick). That’s much higher than ideal. Rogue responded by creating a “shorty” frame height of 13”, which gives you an ideal height of 17.5” when using either fat pad option. I’ll talk more about the Rogue’s height vs the Rep’s height in the bullet below. No wheels or handle. You have to either pick up or drag the bench if you need to move it to a different location. You’re probably strong, so this isn’t the end of the world. But it’s still a bit annoying and wouldn’t cost that much extra for Rogue to add to the bench. Does not have a tripod frame design. Just like the Vulcan Prime 3×3 Flat Bench, the Rogue Monster Utility Bench has a wide post for the front feet. This can throw off your foot positioning depending on your stance. You have to pay extra to upgrade from the standard 2.5” thick pad to either of the two fat pad options. That said, it’s a reasonable $30 upgrade fee. The price is much higher. If you get the standard pad, the retail price is a $265, which is already a full $114 more than the FB-5000. However, most people will probably want one of the fat pads (in which case, make sure to choose the “shorty” frame) — In this case, the Rogue’s retail price jumps to $295, which is nearly twice that of the $149 FB-5000. Shipping will be comparable for both brands. The price difference is by far the biggest hit against the Rogue. It’s in a higher price range that many won’t consider, especially when the comparable Rep and Vulcan benches are so much lower. I think the Rep FB-5000 is the best flat weight bench for most serious home gym lifters. This bench is for you if you’re strong already or plan on getting a lot stronger over the next several years . There’s simply no other flat utility bench on the market with all of these features for such a low price. I might even argue that it’s the best overall flat utility bench on the market. Period. Regardless of price. It’s neck and neck with the rogue in this respect. However, the Rep FB-5000’s tripod frame combined with the inclusion of wheels and a lift handle, make the Rep FB-5000 #1 overall for me. 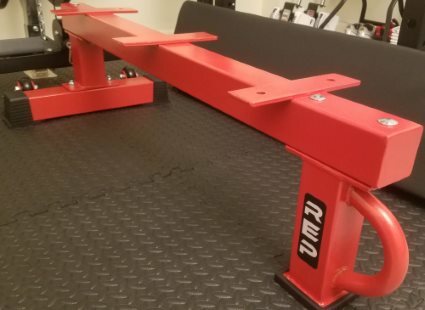 If you’re not planning on benching super heavy now or in the coming years, but you still want a quality bench — I’d suggest looking into the Rep FB-4000 Competition Lite Bench. It’s like the little brother of the FB-5000. It looks similar and has many of its desirable features. The main differences are that it has a lower weight capacity rating of 700 lbs, has a standard 2.5” thick pad instead of a fat pad (it’s still grippy, though) and is more compact in length. It’s also a bit less expensive at $115 plus shipping.